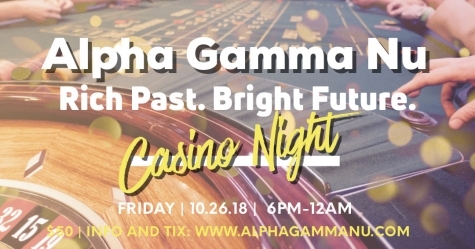 Established at the University of Redlands on October 23, 1923, Alpha Gamma Nu will highlight its 95th anniversary weekend in style with its “Rich Past, Bright Future” themed casino night on Friday, October 26, 2018. Plan to arrive early for homecoming weekend because we will be highlighting our anniversary weekend in style with our "Rich Past, Bright Future" Casino Night. Presented by Full House Casino Events, in conjunction with Bon Appetit and Thr3e Punk Ales, guests will enjoy heavy hors-d'oeuvres, a cash liquor bar, complimentary beer and wine, Las Vegas-style casino games, prizes, photobooth, and more. The event will commence at 6:00 pm on Friday, October 26, 2018, and end promptly at 12:00 am. Alumni are encouraged to bring their wife, partner, or other significant other (aged 21+) to join in the festivities. Requested attire is semi-formal. The fraternity will be hosting a BBQ at the house Saturday, October 27 for all alumni, friends, and family from 12:00 pm to 3:00 pm. Admission to this event is free, but donations of $15 per person are gently encouraged to help cover costs. Burgers, dogs, and non-alcoholic refreshments will be provided. Beer and liquor will be available for purchase. CAN'T MAKE IT? WANT TO DO MORE? CONTRIBUTE TO THE "RICH PAST, BRIGHT FUTURE" GIVING CAMPAIGN. Are you a member of the Gamma Nu facebook page?